After you download the document, you can run the VBA code to set up your editing session. Just select some shapes and click the big button at the top of the page. You will get a connection point shape dropped-on and linked-to every connection point for each shape you’ve selected. You can then rotate the shapes to change the connection point’s angle, and right-click to cange the connection point’s type. Just like the old interface! When you’re done, just delete the blue shapes, and your connection points will retain your changes. 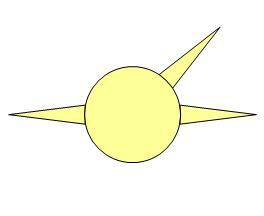 As an example, we have a circle and a spike. The spike shape should attach to the circle at any of eight points, and be normal to the circle upon gluing. 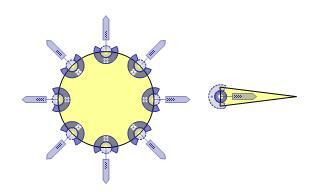 When we run the VBA code, we get connection-point shapes attached to the eight connection points on the circle, plus the one on the spike. You can then rotate the connection-point shapes, and right-click to change the type. Below, we see all of the shapes rotated correctly, and the spike’s connection-point shape has been changed to “Outward” or “Attaches”, which is type 1. Note: If you see red on a connection point shape, that means that there was a custom formula in the connection point cell. Below, we see that the arrow is red. 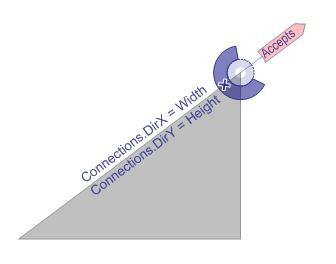 That is because the DirX/A and DirY/B cells have formulas that match the slope of the triangle. I figured you wouldn’t want my tool to mess up any smart formulas that you worked so hard to create! The Connection Point tool is very helpful. I am, however, having problems when I add a number of connection points to a shape and then try to connect another shape (to which I have also added a connection point). It seems if I make my connecting shape smaller, it will snap and glue to the first shape. If I make the connecting shape slightly larger (to the size I want), it will not connect. I’ve tried changing the size of your circle and points and see none of the same problems I am experiencing. When you glue one shape with connection points to another, it depends on where you grab the shape. Visio tries to find the connection point closest to the mouse cursor, and use that as the point that snaps to the other shape. Try dragging your shape from different points. start a temporary line exactly at the point you want the other shape to snap to. Activate glueing and then drag the other shape over the end point of that temporary line. *SNAPP* it goes and your shape’s connection point is glued to your temporary line’s end. Then delete the line — and there you go! I only found out about this solution since I also could not manage to snap or glue connection points of different shapes *to each other* at all (in Visio 2003 that is). I’m missing some of the basic usage model for your tool. I opened my Visio drawing and Connection Point Configuration.vsd. Each is open in a separate window inside Visio. 2. How to specify the shape whose connection point will be set. I selected the shape in my drawing. The shape has connection points. 3. How to set the connection point shapes for selected shapes. 3b: I tried right-clicking on my shape. There are no menu items to add connection points. 3c: There don’t appear to be any menu items or taskbar buttons to add connection points. (Actually, there is a menu item under Tools/Macros/Connection Point Configuration/ThisDocument/AddConnectionPointShapes, but clicking on a shape (with connection points) and then on that button doesn’t appear to do anything. Please help with the above 3 points. 1. The tool only knows how to work with shapes on the same page as the button. You might try copying your shape into the tool document. Otherwise, go into the VBA editor, make your drawing the active window, select your shape, and run the sub routine: AddConnectionPointShapes. This will create the shapes that allow you to easily configure the connection points. 2. This should now be taken care of. 3. See if this makes sense once you get it running properly. I am fairly new to Visio 2003 and already have a problem I cant solve and hope you can help. I am creating a process map to open a bank account. At the beginning of the process you can choose between being an individual or if it will be a joint account. 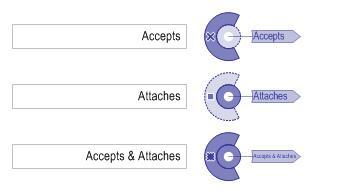 When you choose to have a joint account, the process will continue for some time for both choices until you have to enter the information for the second person on the account. How can I show this in my map? I got the connection points vss loaded and have the tool document open. I have a rectangle with some connection points on the left and right sides. I used your tool to set the direction. Actually, as soon as I added the connection points, they pointed the correct directions…the ones on the left point left. The ones on the right point right. I then deleted the connection points and copied the rectangle back into my symbol. When I placed an instance of the symbol and connected it, all the wires suddenly went the wrong direction, under the symbol in the opposite direction they were supposed to go and then looped around back to the source of the wire! I looked at the ShapeSheet for the rectangle. Great write-up. Thanks for your help. I have a question. The connection points are tiny. Is there a way to increase the size of connection point and change the color. 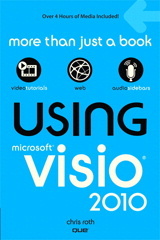 They changed a lot of colors and handle shapes for Visio 2013. I don’t know what they were thinking but shape vertices and connection points are almost impossible to see. And you can’t tell if they are selected because they are so small. I don’t know of a way to change the size of them, I doubt that there is a way. I 100% agree with you. Well, we have to work around it. Thanks for you reply Visio Guy! Hope someone can point out a problem. I am using Visio 2016. I have strange issue with connection points not snapping. I want to create a simple rectangle shape that I can use to build grids. Basically, this rectangle should have outward connection points on the left and top and inward connection points on the right and bottom. When I try to connect one of the rectangle to the other from the right side, it snaps. But when I try to move it from the bottom, it does not snap, or vice versa. Can anyone suggest what could be the issue?